What if you were a superhero, trapped in the life of a Customer Liaison Officer? 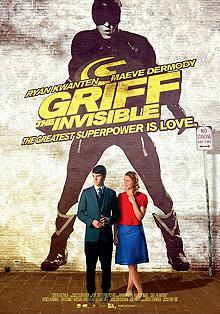 Griff lives two lives - by day a bullied loner in a cubicle-based job; by night he answers a higher purpose. He believes, "It's not a choice - it's a responsibility." Griff the Invisible is an Australian superhero story. Unlike the glossy superhero flicks coming out of America Griff is told in the Australian "realistic" style - no multi-million dollar special effects and no pounding, flashy soundtrack. Griff and his wanna-be sidekick Melody, his brother and his workmates are average Australians performed with mild Australian accents although not in an obviously Australian setting. Who is the masked man with a G on his rubber-suited chest? Is he a superhero or is he suffering a delusion (as his brother believes), or is he skipping between dimensions (as Melody the experimentalist love interest believes). Is there a place for a would-be superhero in our mundane world? Told with compassion Griff nonetheless at times encourages the audience to laugh at, not with, the characters. Certainly the laughter of the review audience wasn't always kindly meant. Griff the Invisible is a different look at the dilemma of superherodom. Griff is the ultimate loner who is about to find his helpmate in the beautiful and equally eccentric Melody. Together they set out to fight the forces of evil with almost supernatural technology and a heartfelt belief in their mutual calling and the challenges that they will encounter will be in the heart and in the mind.